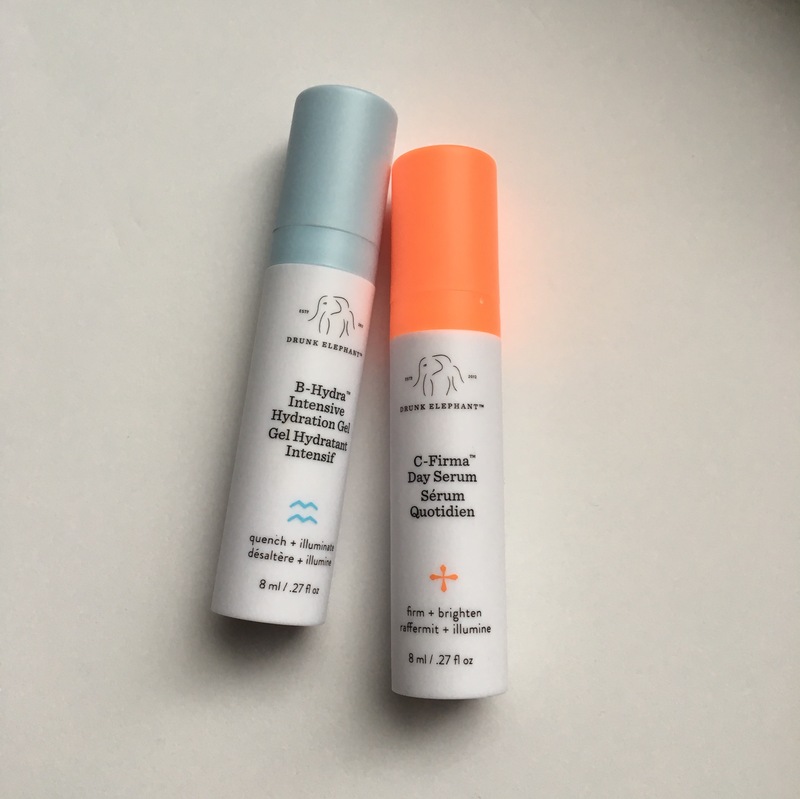 If you follow the online beauty universe, chances are that lately you’ve been hearing a lot of people talking about Drunk Elephant products. I am one of those people who heard the hype, bought the Drunk Elephant Rise & Glow Set, and now I’m here to add to the buzz. I’ve been using these products daily for 2 weeks now. Here is my review! So I have had dry to very dry skin since I was a teenager. My skin often has visible dry patches when wearing makeup and will get drier throughout the day. Sometimes my nose and chin will get slightly oily over the course of the day, but this is rare. I’m not particularly acne prone, but I do get small acne breakouts that usually only last a couple of days. I have redness in many places on my face, freckles, hyperpigmentation around my nostrils, and very dark undereyes with hereditary “bags.” I am 26 and so I’m starting to get very faint forehead lines. TL;DR: I am dry and have unevenly pigmented skin. My previous routine was pretty simple, involving micellar water to remove makeup, gentle cleansers, moisturizer, sunscreen, and an AHA chemical exfoliant. In addition to these Drunk Elephant products, I’ve switched to a more hydrating moisturizer, and cut down my exfoliation from every day to once every three days. My goal with these products was to help reduce the redness and discoloration on my face with the C-Firma and to hydrate my skin deeper and eliminate dry patches with the B-Hydra. So I know that a lot of people consider the price of these products, as the prices are quite high as Drunk Elephant is a newer brand but is “luxury” skin care. During the Sephora VIB sale, I bought the set for $23, plus 15% off. I had been wanting to try a Vitamin C serum and I’m always looking for more hydration, and I had heard AMAZING things about these products. So I figured this set was a good way to try them. This set comes out to an average of $42.60 an ounce vs purchasing both products full sized would come out to an average of $49.07 an ounce. So this set is a good value at a price per ounce comparison! The full sizes are $80 for the C-firma and $52 for the B-hydra. Between sales and discounts/codes at Sephora, Dermstore, and the Drunk Elephant website, you should never have to actually pay full price for these products. C-Firma: Water, Ethoxydiglycol, Ascorbic Acid, Glycerin, Laureth-23, Lactobacillus/Pumpkin Ferment Extract, Sclerocarya Birrea (Marula) Seed Oil, Ferulic Acid, Sodium Hyaluronate, Algae Extract, Camellia Sinensis Leaf Extract, Lactobacillus/Punica Granatum (Pomegranate) Fruit Ferment Extract, Glycyrrhiza Glabra (Licorice) Root Extract, Vitis Vinifera (Grape) Juice Extract, Phyllanthus Emblica (Indian Gooseberry) Fruit Extract, Hydrolyzed Wheat Protein, Tocopherol, Caprylhydroxamic Acid, Acetyl Glucosamine, Hydrolyzed Quinoa, Glutamylamidoethyl Imidazole, Dipotassium Glycyrrhizate, Tetrahydro Curcuminoids, Sodium Hyaluronate Crosspolymer, Glycine, Sucrose, Maltodextrin, Propanediol, Caprylyl Glycol, Sodium Hydroxide, Phenoxyethanol, Xanthan gum, Hydroxyethyl Acrylate/Sodium Acryloyldimethyl Taurate Copolymer, Isohexadecane, Polysorbate 60. So the biggie here is the L-Ascorbic Acid 15%. This is often known as the “best” topical Vitamin C. This product is also kept at the pH necessary to make the Vitamin C effective on the skin. You can also see that there are hydrating ingredients (glycerin, marula oil) as well as fruit extracts that Drunk Elephant says are used for various skin benefits. So the Panthenol is the Vitamin B5 that they are advertising to help the skin retain moisture and preserve the moisture barrier. It is interesting to me that this ingredient is so far down on the ingredients list, but Drunk Elephant also lists the various fruit extracts as being beneficial to the skin. So there’s not too much to say here… these products come in 100% opaque packaging which is especially important with the Vitamin C serum and its tendency to oxidize. This is only slightly annoying because there is virtually no way to tell if you’re close to running out of product. They both come with pumps. C-Firma: This serum comes out orange (which is due to one of the extracts and not oxidation) and is a bit sticky on the hands. I apply it by rubbing it on my hands for a second, then quickly spreading it over my face. I do it this way because this product absorbs very quickly into my skin. It has a weird smell, but I’m okay with that as skincare doesn’t need added fragrance. I did notice that for the first couple of days using this, my skin looked very shiny and orange. Now my skin soaks it up. B-Hydra: This stuff looks like a lotion & gel hybrid. It’s a translucent white color and spreads very easily onto the skin. It feels VERY hydrating when you spread it on your skin and almost has a cooling effect, but more of that feeling of drinking cold water when you didn’t know you were thirsty, but on your face. If you find the C-Firma hard to spread, you can mix the two together. You can mix the C-Firma with any plain moisturizer. You are just generally not supposed to use Vitamin C at the same time as a retinol/retinoid product. Retinols work best at night and Vitamin C works well for the morning (especially with sunscreen!). I am SO sorry that I did not take before/after photos, so you will have to take my word for it. I didn’t even think about making a blog post for these. Basically, my skin has improved immensely. C-Firma: My redness and general hyper pigmentation has greatly reduced in the last two weeks. I don’t know if I can 100% attribute this to the C-Firma because the better moisturizer and less exfoliation may have also helped. BUT I do think that this product has given me visible results. My skin is brighter, less dull, and more even. I still have redness on my cheeks but it is greatly reduced and the redness on my forehead, chin, nose, etc… is pretty much gone. B-Hydra: My dry patches are pretty much gone, except for between my eyebrows which still likes to flake up sometimes. I can’t fully attribute this to the B-hydra though, because I also switched moisturizers. But I can say that the B-hydra feels really good and it definitely adds moisture. If you are combo/oily skinned, you might like this alone as your day time moisturizer. I need a bit more with my dry skin. Overall I am VERY happy with the performance of these products and my skin is looking SO good right now. I was struggling through this winter and I wish I had known about these products sooner to help with my dry patches and redness/pigmentation issues. I would 100% recommend these products to anyone as long as you can afford them. I understand some people just think that these prices for skincare are absolutely ridiculous and I somewhat agree… but these are still very nice products that give results without irritation. If you have the money for full sizes, I’d say you should buy the mini set to try them out. If you don’t, then I’d check out The Ordinary B5 + Hyaluronic Acid serum and the Timeless Vitamin C serum. I have not tried them personally but they are highly praised products that have the same main ingredients, and just lack the fancy extra oils, extracts, and such. I will probably try these dupes at some point. I hope this was helpful to anyone considering these products! Do you recommend also using a moisturizer with the hydration gel? I do because I have dry skin! If you’re oily your probably don’t need it.